Waves lapping gently against a hull do it for me. A few red wines sometimes do it for me especially when salty sea air wafts over a boat deck. On this occasion, a new cruise ship certainly did it for me too. We’re talking about the enjoyment of staying overnight out at sea! Ipipiri is a 46m (150ft) catamaran, named after one of the original Maori place names for the Bay of Islands. 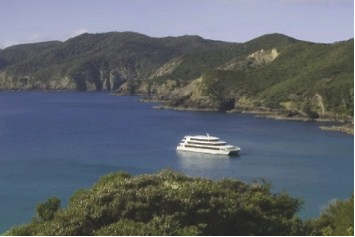 It’s the largest overnight cruising ship based in New Zealand and, with four deck levels, it’s easy to see why. There are two sleeping decks, a spacious 70-seat restaurant with indoor and outdoor dining and bar, as well as a large sundeck located on the top deck. The day we boarded the vessel a conveyor belt of cloud was moving over the North Island, bringing with it showers and southwest winds. However, with a vessel this big it was hardly noticeable. As we cruised towards our evening’s mooring we passed the town of Russell. The Bay of Islands is today well-known for its heavily stocked fishing grounds, but back in 1926, Russell was still just a small hamlet, lined with quaint white houses and a crescent shaped beach. Surprisingly, given its remoteness, it was a place gaining a “big fish” word-of-mouth reputation. Wealthy anglers from as far away as Australia, India, Britain, America and South Africa were all willing to travel here to try their luck. The well-known western author, Zane Grey and his fishing companion, Captain Laurie Mitchell, didn’t believe in luck. They were by far the most experienced of the international anglers present, outfitted with the most expensive tackle and possessing the latest techniques; they were well initiated in the art of big game fishing. Early Pacific traders and whalers had established Kororareka (now Russell) as New Zealand’s primary resupply port. It’s been recorded that on one single day in 1830, over 30 ships lay at anchor nearby, averaging 300 men per ship. About 9,000 sailors, whalers and traders would have turned the peaceful Maori fishing village, where only a small handful of Europeans actually resided, into a colonial harbour of significant proportions. No wonder it became known as “the hell hole of the Pacific.” American, British, French and colonial ships were especially interested in the whaling prospects in and around New Zealand waters. Today ships and boats of all shapes and sizes call these waters home, including Ipipiri. 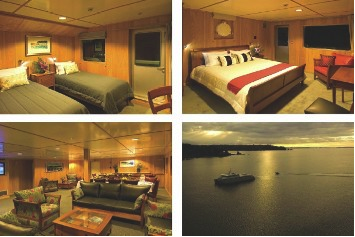 With accommodation for 60 passengers, Ipipiri’s lower decks have 30 identical deluxe cabins with king bed/ private en-suite, all with panoramic views. The king-size rooms are spacious and the bathrooms small but immaculately presented. One of the ship’s coolest attributes is the stainless steel mesh after-deck that lowers the beach boat or kayaks straight into the water, and in similar fashion picks up activity minded passengers later in the day, without them ever getting a foot wet. Activities include island beach walking excursions, snorkelling, and escorted kayak tours, that let you discover secluded beaches, hidden caves, bird and marine wildlife. On our second day, in squally showers and strong winds, we were picked up from the ship to spend a few hours’ fishing near the Cavalli Islands. With deteriorating weather, it was never going to be a Zane Grey type of day. Finally with a dozen, dinner-sized snapper in the bin, we headed back to the warmth of a local café in Paihia. If like me you get a chance to spend a night at sea, do it in style on the Ipipiri as it’s a sensational way to experience this region’s natural beauty in an area immersed in New Zealand maritime and Maori history. Ipipiri sailings depart Opua 12.30pm most days and includes: a deluxe king cabin, 3-course buffet dinner, buffet-style cooked or continental breakfast, complimentary tea/coffee in the dining room all day, complimentary snorkeling/kayaking equipment, island excursions plus interactive onboard commentary exploring the history, wildlife and ecology of the Bay of Islands. Overnight sailings commence 1st October. The vessel is also available for exclusive hire. Launch special runs until 20th December 2009 – $199pp twin share, child 2-14 years $199. 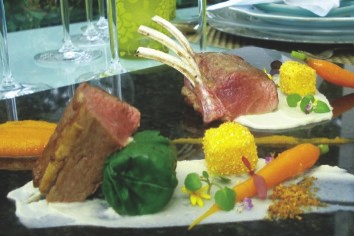 21 Dec ’09 – 10 Jan 2010 – $366pp twin share, child 2-14 years $199. 11 Jan – 30 Apr 2010 – $399pp twin share, child 2-14 years $229. All prices include gst.